Ecofan 815 Mini Wood Burning Stove Fan - Feel the heat faster and use less fuel with the best mini stove fan. These genuine Caframo/Calfire Ecofans are heat-powered fans designed to circulate the warm air created by a wood or gas stove. They help heat up the room more quickly and efficiently. You'll use less fuel and feel more comfortable with one of these stove top fans. They're ideal for wood burners and multi-fuel burners. Height 165mm (6.5”) from base to top of the blade (excluding fold down handle). Must be installed onto a flat surface. Please ensure that there is sufficient space on the burner, please take consideration of the blades rotation when measuring. The Ecofan 815 is designed to be used on freestanding stoves with normal surface temperatures on 110°C - 345°C. Temperatures above 345°C may damage your Ecofan. Relocate your Ecofan to a cooler spot on your stove if the surface temperature exceeds 345°C. Good wood stove practice includes using a stove thermometer. Ensure the Ecofan handle is upright before placing on the stove. While in use, the base of the Ecofan is very hot, when repositioning always use the handle. For optimum performance, placement on the stove's surface is critical to allow cooler air to be drawn over the cooling fins. 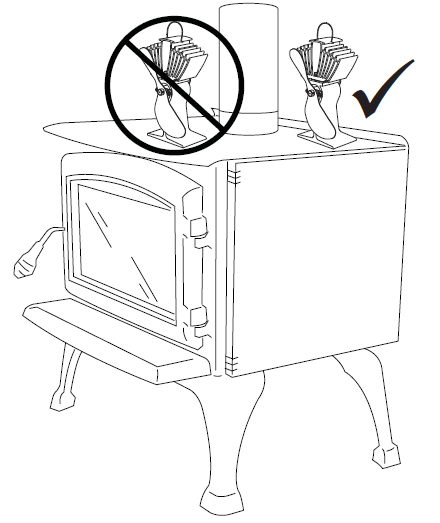 Place the Ecofan at the back corner of the stove as shown on the diagram. Should the gap between the Ecofan and the back wall be less than 150mm (6") then move the Ecofan forward along the side of your stove and turn it in slightly. This should ensure the fan can draw the necessary cool air from the rear/side of the stove. The Ecofan should not be used directly in front of the stove pipe or at the front of the stove as this will lead to reduced performance. The Caframo Ecofan is a heat-powered fan designed to circulate the warm air created by a wood or speciality stove. Improved warm air circulation results in greater comfort and less fuel consumption. Costs nothing to run… Using the heat from the stove, the Ecofan is the most economical way to effectively circulate warm air. No cables, plugs or batteries are required. Test results using AMCA testing standards prove that most air flow claims made by other stove top fan manufacturers are much lower than publicised, some by as much as 45%. Ecofans last longer because they are made in Canada, utilise a superior design that operates more efficiently and effectively than 4 or 5 blade models and, is the only fan with a user serviceable replacement motor. More Ecofans have been sold than all other stove top fans combined. Caframo invented the fan and have two decades of experience perfecting it. This means low failures and high customer satisfaction. Sold with 1 year warranty. Fully CE compliant…. None of the Chinese copy stove fans meet this approval despite what is printed on the boxes or their importers claims. For a more powerful ecofan choose the Ultair 810, it moves up to 125 cubic feet of air per minute, saving you 14% on fuel. For the most powerful ecofan choose the Airmax 812, it moves more air, up to 175 cubic feet per minute, saving you 18% on fuel. Which Caframo Ecofan should you choose? The 812 AirMax Ecofan is the superior choice for anyone with a wood burning stove, providing the highest air flow and starting to work at the lowest temperature. Still providing excellent results but with slightly less air movement and a higher starting operating temperature is the 810 UltrAir. Both the 812 and 810 offer 2-year warranties. The 800 Original and the 800 Original Mini are good basic wood stove fan, they operate at a lower level of air movement and come with a 2-year warranty. Warranties - Ecofans are warranted to be free from any manufacturer’s defects in material and workmanship for a period of 2 years from the date of purchase. Should an Ecofan become defective or fail to operate under normal conditions within this 2 year period, you must in the first instance email ecofans@calfire.com advising which model you have; the serial number of your unit (found on the underside of the top casting); when and from where you purchased the item and details of the fault you are experiencing. Please note that you must email ecofans@calfire.com before returning any Ecofan to them. If a fault is discovered with your Ecofan we will reimburse you for the carriage paid to return to Calfire up to a value of £5. Once received Calfire will produce a refurbishment report and quotation and forward this to you by email or post. If you are happy with the quotation you will be asked to provide your payment details and your Ecofan will then be refurbished. The fan will be tested prior to being returned. Occasionally units that have been subjected to extreme heat will be beyond repair. Should you decide not to proceed with the repair, or the fan is beyond repair, a small postage charge will be requested to pay for the fans return or the fan will be disposed of. Refurbished units are covered for a full 1 year from the date you receive them back. The refurbished unit warranty conditions are the same as for new units. Click the button below to add the Caframo - Ecofan 815 Original Mini Wood-Stove-Fan to your wish list.